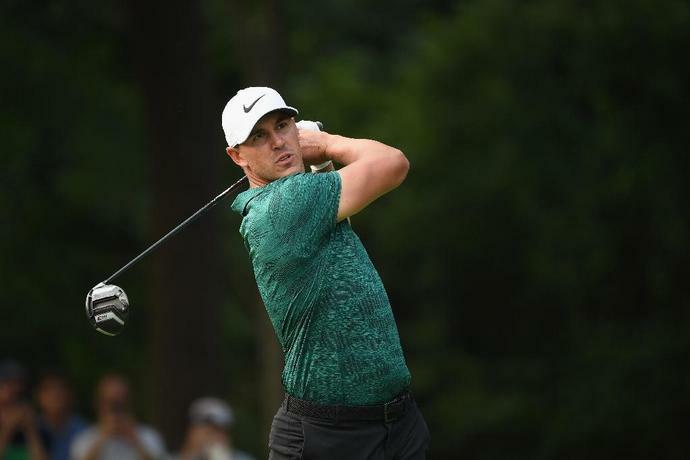 St. Louis (AFP) - Sitting on a couch watching the Masters on television with an injured left wrist, Brooks Koepka never dreamed he would win two majors this year, much less battle his boyhood idols. But the 28-year-old American did just that, defending his title at the US Open in June and taking his third major crown Sunday at the PGA Championship by two strokes over Tiger Woods. "When I look at what I've done in the past two months, it's incredible," Koepka said. "Looking where I was, sitting on my couch watching the Masters, to think I would do this, I would have laughed at you and told you there was no way, no chance. I can't even believe it." As impressive as his long drives was Koepka's coolness under pressure, a composure that has become a trademark. "When I show up to the majors I'm very focused, very disciplined," he said. "For some reason the majors get my attention. When you're firing at flags you have to be calm and focus on every shot." To battle Woods and 2013 Masters winner Adam Scott, an Australian who took third, was a dream for Koepka, who idolized both in his youth. "To duel it out with them, it's pretty neat. I don't think I ever dreamed of that situation that I was in," Koepka said. "It really is surreal." "It's tough to beat when the guy hits it 340 (yards) down the middle," Woods said of Koepka. "When a guy's doing that and hitting it straight and as good a putter as he is, it's tough to beat." Scott sees how Koepka handles himself in the biggest moments. "What has been interesting to watch is how much of a big time player he is," Scott said. "I'd just keep doing what he's doing because he's showing up at the right moments in the biggest events. He's got that mindset. There's something inside his brain that makes him believe that's what he's destined to do." Koepka gets into a routine and keeps swing coach Claude Harmon III, his chef and a physiotherapist near during majors. "He has a unique ability on these really intense weeks to be the calmest he is all year," Harmon said. "Brooks is a creature of habit. He enjoys keeping the same guys around him. He likes the routine. That's one reason he's so successful. He's able to keep things normal. He doesn't get too high. He doesn't get too low." He admits being down when injured but adds, "I've never been more focused, more driven, more excited to play." Koepka has won three majors in 14 months, the fastest such run since Ireland's Padraig Harrington took the 2007 British Open and 2008 British Open and PGA. Koepka was most proud of a 247-yard tee shot to six feet that set up a birdie at the par-3 16th hole. "I hit a laser right at the flag," he said. "That will probably go down as probably one of the best shots I've ever hit under pressure." And he felt pressure as the roars for Woods reverberated across the course. "You could hear a different roar like every 30 seconds, so we knew what was going on," Koepka said. "It's pretty obvious when Tiger makes a birdie. I'm sure everyone is rooting for him. "I was very impressed with the way I hung in there. But to hear some of these roars, I can't even begin to tell you." Even so, it didn't rock Koepka's indomitable self confidence. "I knew even when everybody was making that charge, if I just hung in there, made one good shot at a time, kept it rolling, I was going to have a chance to separate myself," Koepka said. "And that finally came." The surgeon who advised Tiger Woods to undergo his career-saving spinal surgery has revealed that he did not expect the American to reach the level that would win him another major trophy. Damian Fahy, consultant spinal surgeon at the Fortius Clinic, told The Daily Telegraph Woods was in pain almost 24 hours a day before he had spinal fusion surgery in 2017. The surgeon, who also advised Andy Murray ahead of his recent hip operation, said that Woods reminded him of the Scot in his professionalism and careful management of his treatment. Tiger Woods' five Masters victories have spanned more than two decades and coincided with what many consider to be the Golden Age of golf equipment technology. Certainly Woods' use of the multilayer, solid-core Nike Tour Accuracy TW ball was a paradigm shift for equipment used by tour players and the distances they hit them. Woods' Masters career has also seen players go from drivers in the 260 cubic-centimeter range to 460 ccs, and in Woods' case, the move from steel to graphite shafts in metalwoods.